Archives For Shall I compare thee to a summer’s day? While most students do want to share what they did, the results can be mixed; not all summer vacations are alike. Plus, how does a student respond to such a broad topic? Instead, a teacher could use art as a prompt to get students to write about a vacation. 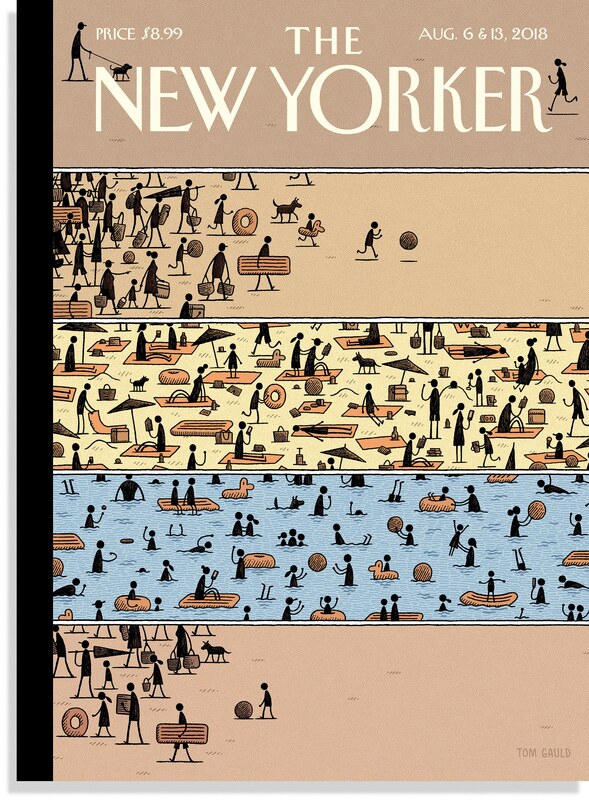 The illustration on the cover for The New Yorker, (August 6 & 8, 2018) by Tom Gauld is the most recent take on one summer’s day. Tom Gauld’s “On The Beach” cover illustration August 6 & 13, 2018, New Yorker Magazine. The four panels are stacked to allow the viewers to compare the actions of a crowd of one-dimensional figures. The first has them coming to the beach. The second has the figures lounging on the sand. The third has the figures swimming in the water, and the fourth shows them leaving to return home. The active figures in the first three panels are drawn as more subdued in the last panel, implying that the figures are tired after a day of fun in the sun. In an interview by Françoise Mouly July 30, 2018, Gauld explains that his inspiration for the cover illustration was a 1940 photograph by Weegee of beachgoers on Coney Island. 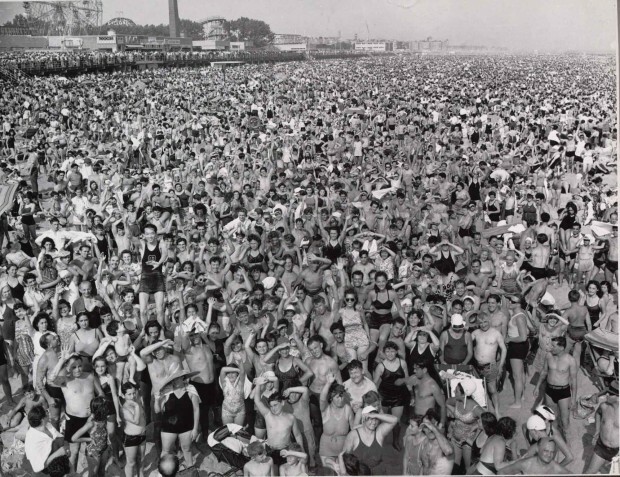 The Metropolitan Museum of Art: “Coney Island Beach” by Weegee, gelatin silver print, 20.6 x 25.4 cm (8 1/8 x 10 in. ), 1940. Accession Number: 1987.1100.252. © Weegee / International Center of Photography. The huge crowd, immortalized in one moment, illustrates the popularity of the beach, but there is no comparison photo of the same crowd later in the day. The use of panels in Gauld’s magazine’s cover could be compared to another magazine cover, specifically the panels in an illustration by Norman Rockwell. The illustration titled Coming and Going graced the 1947 cover of the Saturday Evening Post. Rockwell also stacked his panels to juxtapose characters traveling to and from Bennington Lake. Norman Rockwell (1894-1978), Going and Coming, 1947. Oil on canvas, 16″ x 31 1/2″. Cover illustration for The Saturday Evening Post, August 30, 1947. Norman Rockwell Art Collection Trust, 1973. In the illustration, Rockwell’s realistic and fleshy characters are active in the top panel. Two boys hang out of the car in anticipation in the first panel. Those same characters appear exhausted in the second panel inferring a day of physical and energetic activity. Like Gauld, Rockwell also drew his inspiration from another piece of art. 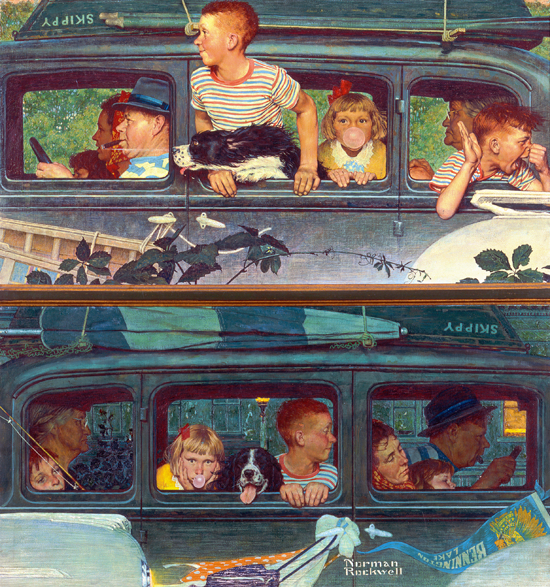 According to a page on the Norman Rockwell Museum website, George W. Wright’s painting of Going to and Returning from the Seashore served as the inspiration for Going and Coming. 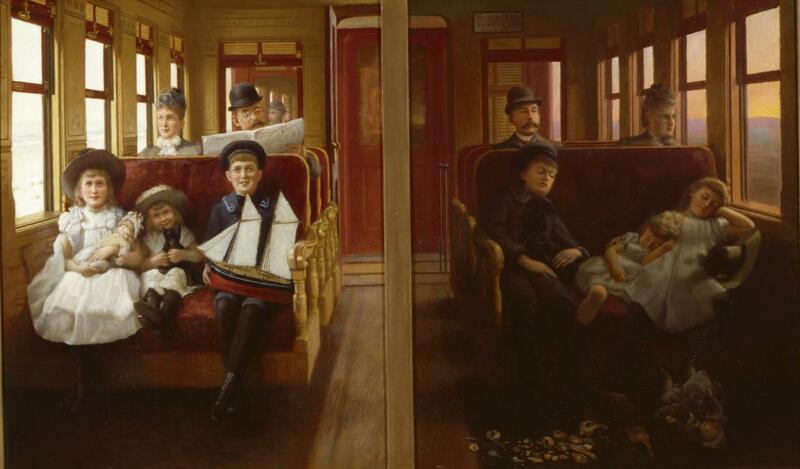 Wright’s painting is a side by side comparison of a family on a train preparing for a day of fun by the sea. The alert and smiling children in the first panel are slumped and asleep in the next, with their collection of shells strewn below them. The parents behind them offer glazed stares. Wright, George. Going to the Seashore and Return from the Seashore. 0126.2265. early 20th century. Tulsa: Gilcrease Museum, https://collections.gilcrease.org/object/01262265 (02/14/2017). In contrast, both the dogs appear tired in the final panels, one with four feet on the ground and the other seated. The covers and photo all can be used to generate talk about what is good about a day off in summer or a day spent in fun with family and friends. Students at every grade level can describe how the artist in each piece uses physical details in the “before” and “after” to create an emotional tone. These prompts show students how these details combine to represent one day, a snapshot of a summer vacation. Instead of a tired written prompt to generate a student response, teachers could use these visual prompts. Student responses to summer vacation responses can be imitated or elaborated in a drawing as well. Such prompts are engaging and can be enjoyed by all students, whether the students can read or not. Shall we compare these to a summer’s day? A summer’s lease captured in these portraits.